The science of turning ordinary metals into gold has been a long and fabled tradition, the various permutations of which stretch through the furthest reaches of philosophy, folklore, medicine and desire. Whilst humankind may kept the art of turning metal into gold solely in its philosophical premise, the art of creating magic, transforming ordinary elements into something infinitely valuable has permeated into every aspect of life. 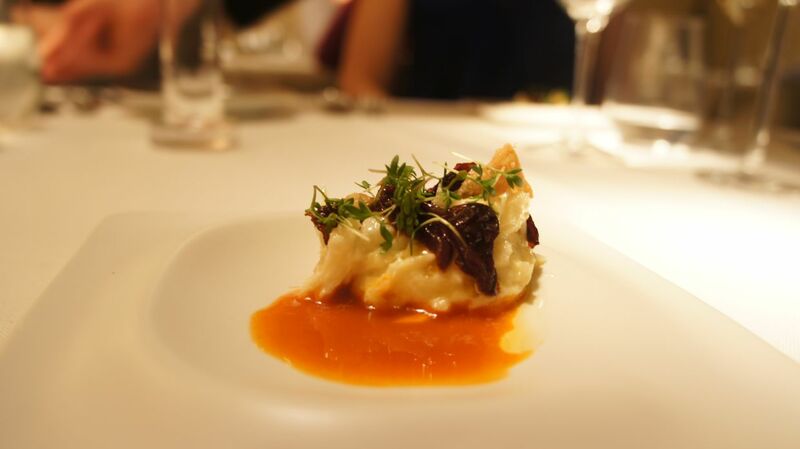 Food has always been child of alchemy, the creating fine dishes out of the most basic and simple ingredients, nourishing, desirable, addictive to a cult status; indeed, cuisine upholds the very philosophies of alchemy and fascinates us every single day, urging us to seek out more and more alchemists and revel in their success. It is, then, no surprise that a restaurant be named Alkimia, paying homage to the fine science of creation and pleasure. 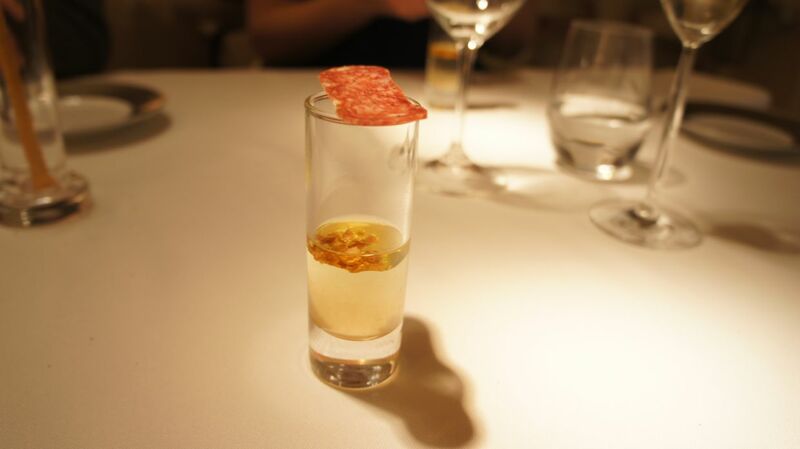 Tomato water, olive oil and sausage: light and refreshing. Cod with trinxat and pepper: A Catalonian ‘brandade’ where the trinxat is a potato and cabbage mixture. Came with the most intense semi-dried peppers. 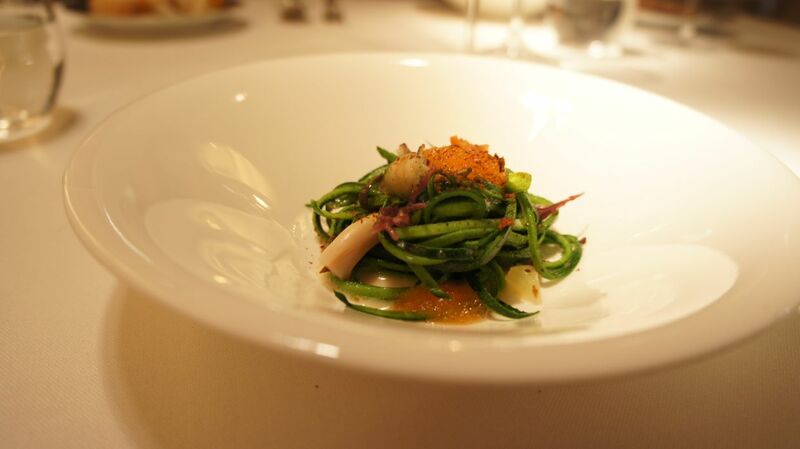 Spaghettini with sea fruits: Courgette spaghettini, goose barnacles, razor clam, octopus, fish roe. Served cold. Two thumbs up! 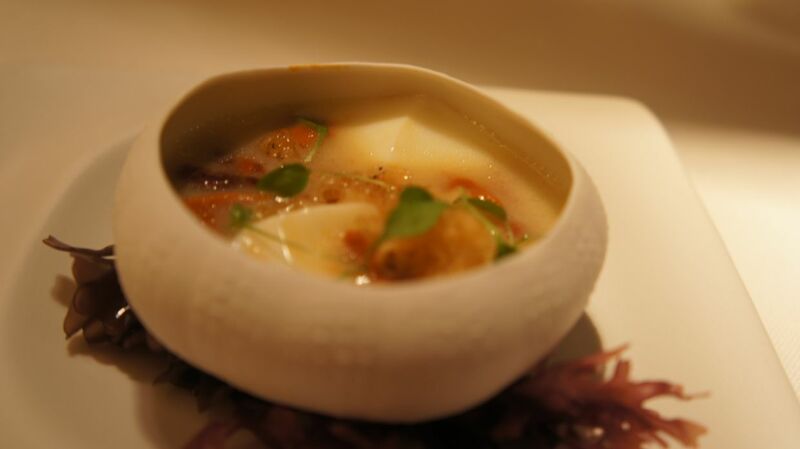 Sea urchin, egg, chicken broth: A light and very delicate broth. Didn’t do much for any of us. 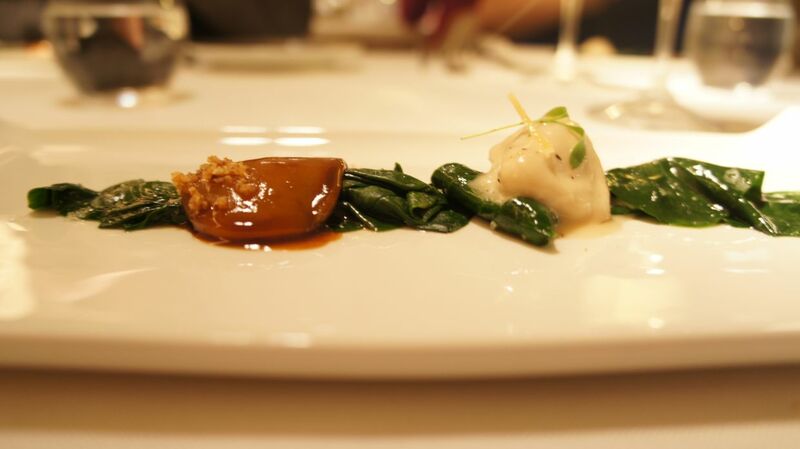 Pickled oyster, glazed pork cheek, spinach: A surf n’ turf like no other. Not much to look at, but what intensity of flavour. Ridiculously succulent pork cheek, incredibly meaty glaze and a huge oyster in a pickled glaze. Divine! 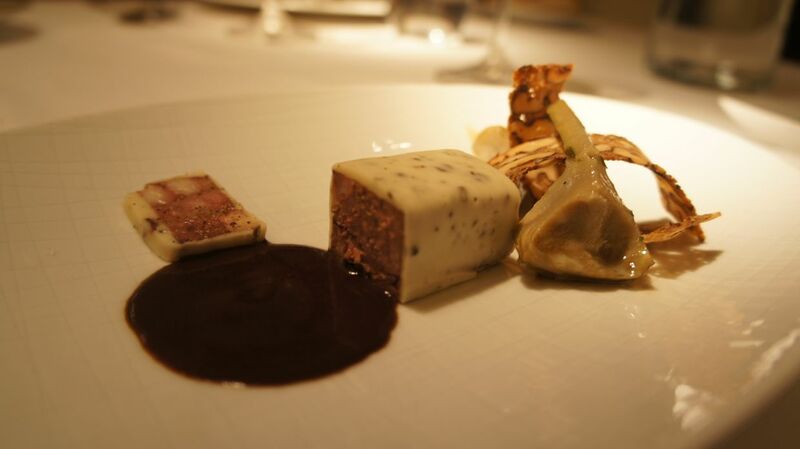 Game terrine, artichokes, pine sauce: a mini terrine (since I couldn’t eat the prawn course! )…all the right elements and balances. Perfectly sized. 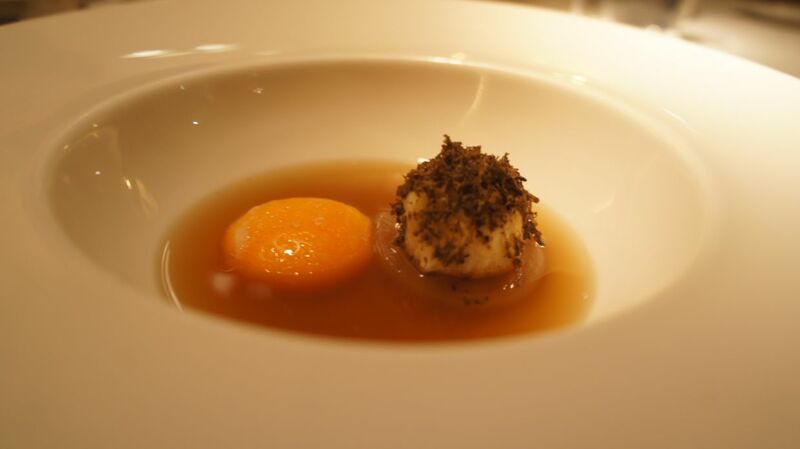 Onion soup, herb dumpling, egg yolk, truffle: Bland and nothing special. 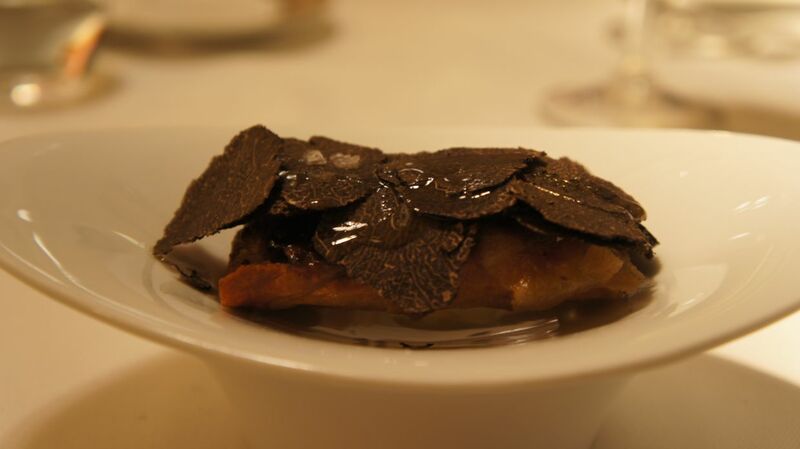 Baked chicken canneloni, almond bechamel, truffle: Crispy, creamy, meaty, earthy. Quite a pleasure to munch on. 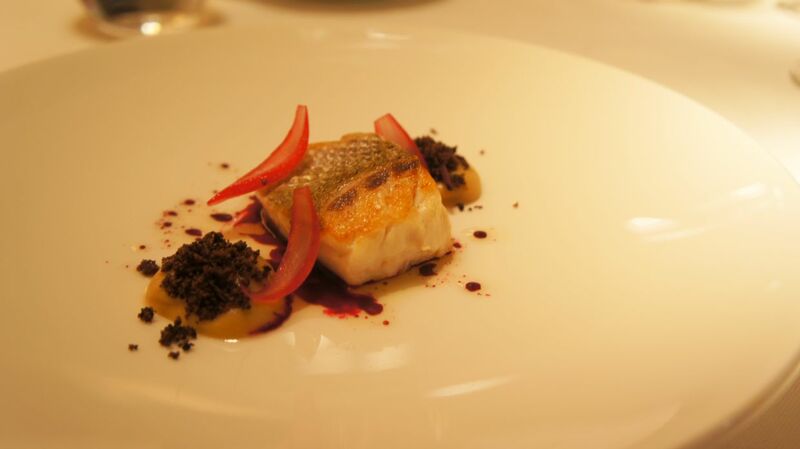 Sea bass, olive crumb, onion: delicate little pickled onions and onion puree, black olive ‘dust’ – can’t go wrong. Little bite of happiness. 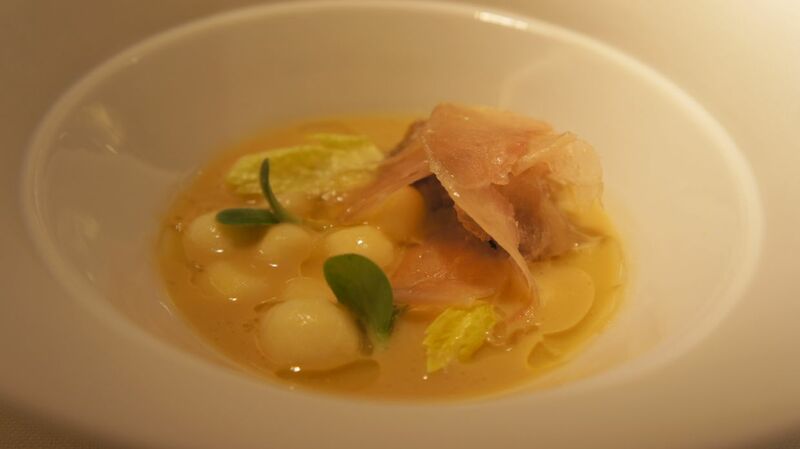 Special chickpeas, pheasant: the special chickpeas are actually little chickpea gnocchi that look like chick peas. Wafer thin slices of pheasant ‘ham’, scrumptious pheasant sauce. Very lovable. 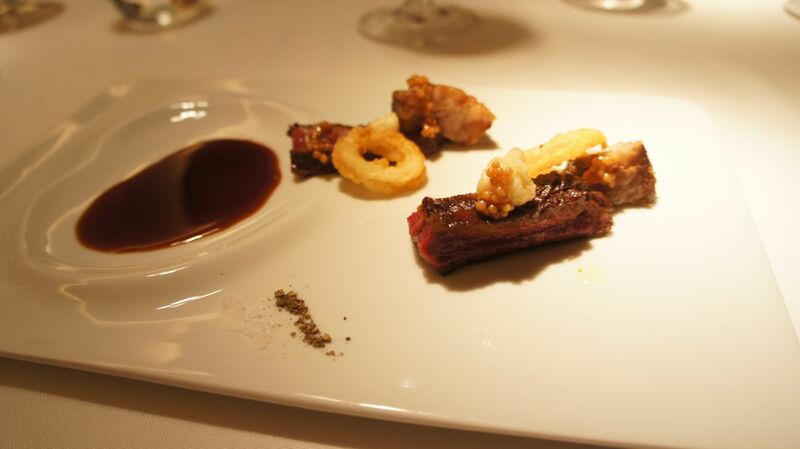 Beef, onion, mustard seeds: beautiful piece of meat, succulent beyond belief and the dainty crispy onions adding a touch of classic to it along with pickled mustard seeds. Cucumber, tomato, ewes ice cream: Delirious happiness on a plate. 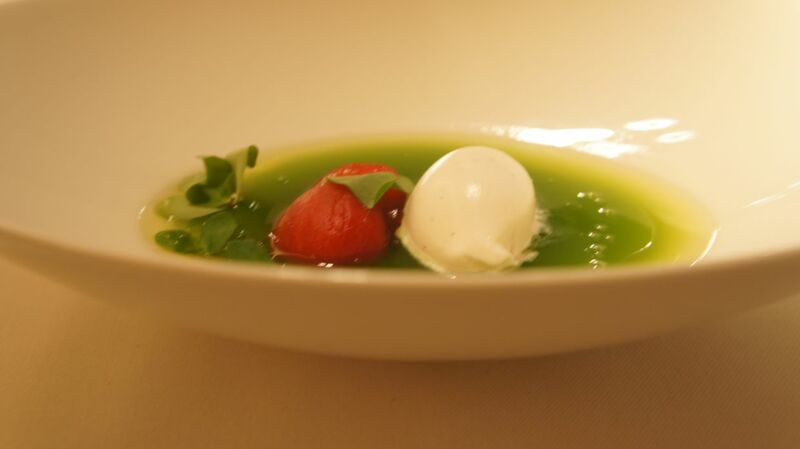 What a glorious dessert this was, flirtatiously sweet cucumber gazpacho, fruity tomato and a magnificent ewes milk and vanilla ice cream. Divine. 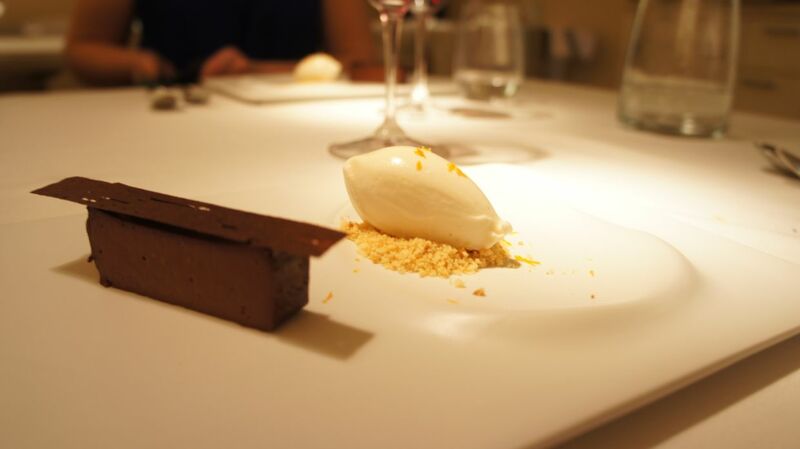 Chocolate fondant, burnt rum ice cream: Whilst the fondant itself was incredible – soft, creamy, light and intense, it was the burnt rum ice cream that stole the show – it just got better and better with each bite. 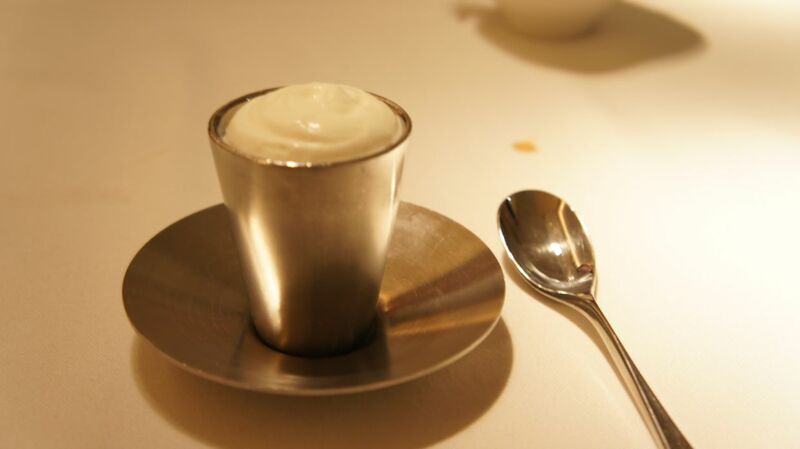 First petit four was Yoghurt foam, pumpkin cream and this was magical. Two flavours, but so incredibly moreish and very much happiness inducing. 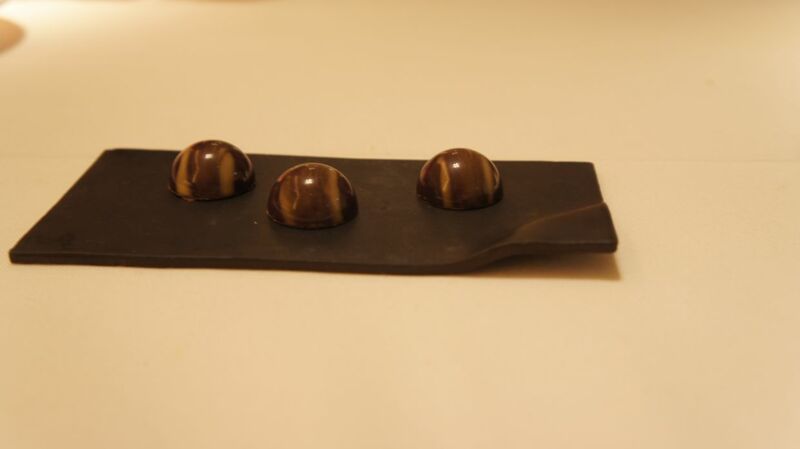 If there is a rival to salted caramel truffles, these Pine nut chocolates are the heavy contenders. We even asked for a second helping! 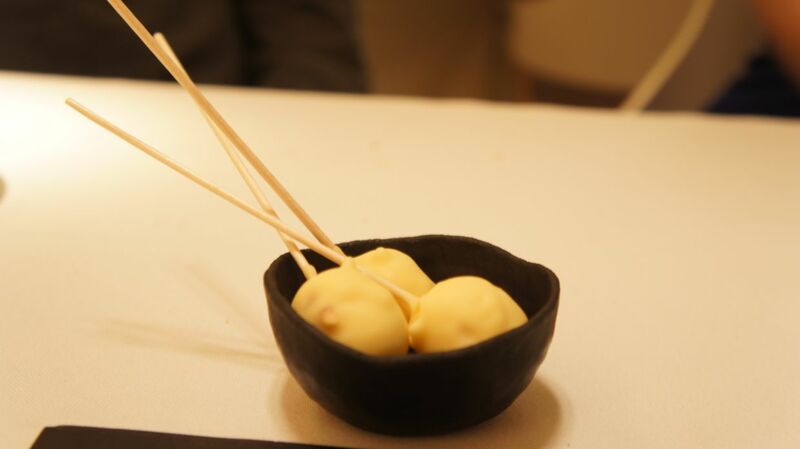 And finally, passion fruit sorbet lollipops to finish the meal. Always a satisfying little treat! The best thing was that after all this we could still walk around and enjoy the rest of the day without being in a food coma! All washed down with some spectacular Albarino wine, this was a very satisfying and memorable afternoon! And that’s what culinary alchemy is all about!